Robert Bowlin is the 1979 National Guitar Champion. He has been a member of the Bobby Bare Band, & the 'final' Fiddler for Bill Monroe & the Bluegrass Boys. This course has tablature for both the melody solo & the harmony part that fits it. For intermediate-advanced players. The melody solo is recorded in the left channel & the harmony (twin) is in the right for isolation purposes. It is also a 'beautiful listening album'. The audio is accompanied by: Dan Huckabee-dobro, & Robert himself on banjo, fiddle, guitar & bass. Songs Include: Lonesome Fiddle Blues, Roanoke, Festival Waltz, Scotland, Gypsy Swing, Jerusalem Ridge, 8th of January, Apple Blossom, Opus 57, Snowball (CD & Tab) *Robert Bowlin is the 'cover story' in the Sept/Oct issue of 'FLATPICKING GUITAR MAGAZINE' -------------------------------------------------------------------------------- About Robert Bowlin We affectionately call Robert Bowlin . . .'The World's Greatest Bluegrass Guitar Player.' 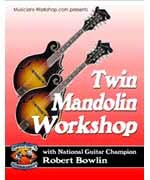 Robert was the 1979 National Guitar Champion & Bill Monroe's final fiddle player. As a Blue Grass Boy: Robert Bowlin was the last fiddler to join the Blue Grass Boys. He plays on the recording of 'Boston Boy' that closes the boxed set 'Music of Bill Monroe, 1936-1994' Recording Sessions: 1/9/1994 He has created audio lessons in twin guitar and twin mandolin playing for Musician's Workshop, and has recorded as a sideman with many bluegrass and country artists. As of late 2001 he was playing fiddle with the Osborne Brothers. Robert is the cover story in the Sept/Oct 2001 issue of Flatpicking Guitar Magazine.